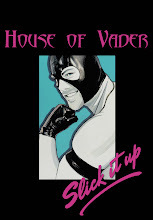 Click on SLICK IT UP to pick up any of these pieces at a discount using coupon code "houseofvader"
Who is the model in the super hot alien contour body armor? I've always wondered. He is really good in all 3 commercials.